It is the feeling of air or sun on your skin and the sense of fun and being a bit exhibitionistic that adds to the pleasure of taking a shower or bath outdoors - totally undressed of course. Granted, you may not live in a tropical paradise with temperate climate year-round, but with good planning, you can still enjoy an outdoors bath. A good compromise would be to build your bathroom in such a way that you can fully enclose it when necessary and shut out inclement weather. Seen another way: be able to open up as much as possible to benefit from days with glorious weather. Typical bathroom layouts may have the shower area completely outside, albeit in an enclosed courtyard. The rest of the bathroom, i.e. bath, vanity and toilet will remain part of the house but flowing into the garden area. This type of layout is easy to cordon off when the weather is not ideal or if you simply wish to have it enclosed for a change. The only element to consider when closing off, is to add an additional shower facility - for when you prefer to take a shower. With so many styles of shower fittings available, you could easily add a shower to your bath, for example. Glass sliding doors are great to enclose the bathroom when necessary. It will still offer the extended view into the outside area, whilst offering protection from the elements. Alternatively you can take a look at plantation shutters or reed mats although they may not be totally windproof. 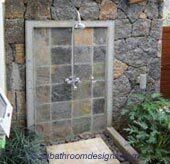 The design outcomes of outdoor bathrooms depend on the creativity and style of the owners. So whether your outdoor bathroom is on your deck, in your backyard, hidden in your garden, or semi-attached to your house, the aim is to ensure that the unit blends well with its surroundings and doesn't stick out like a sore thumb. The best way to achieve this is by mimicking the architectural style of your house. Designing any space is all about accessorizing. The difference between boring and beautiful is the accessories used. They bring harmony, add color, and single-handedly create the right ambience. So choose a bathroom theme and stick with it. Antique, modern, Asian, Hawaiian, are just some of the themes you can consider. Hardware fittings like a wrought iron mirror frame in antique finish not only make an excellent focal point, but give character to the bathroom. A pair of oars for hanging your robe or towel, or an old painted bench can add character, too. And no garden shower area is complete without plants and flowers in different colors, so add lots of plants. The best accessory is, without a doubt, the view. The better the view, the better the bathing experience. In order to create your perfect 'natural retreat' you'll need to decide on the more functional aspects in conjunction with your architect. Shower area, bathtub, towel stand, drying area, grooming station, sink, garden, and plants... should use materials that can handle the fury of nature, as and when it may be unleashed. Use durable outdoor materials like stone, treated wood, wood (teak, cedar, mahogany etc), stainless steel meshes, and nylon ropes etc. that are resistant to dampness and mold. Privacy is a primary concern for many. Since the concept of outdoor bathrooms is dependent on location and surrounding landscape, elements like hanging plants, screens, pergolas, and trellises (among others), it's important to meticulously work out the placements of these elements. For enhanced privacy, screens, partitions and stone walls can separate various functions. Climber plants are also a good choice to help provide seclusion. Spare a thought to lighting of the outdoor bathroom. During the day there will be plenty of light but night time is a wonderful opportunity to blend starlight with your unique bathroom lighting. 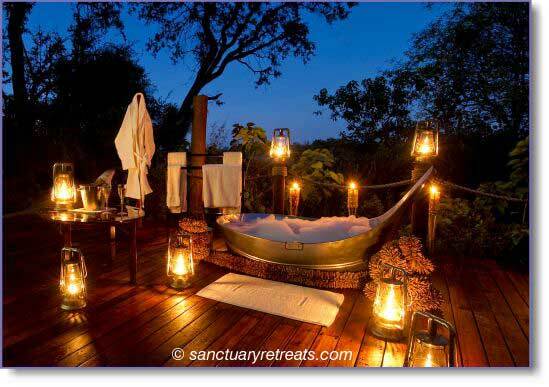 If you are lucky enough to have a location - as in this bathroom at Sanctuary Baines' Camp - with starlight and fireflies, the only additional lighting needed can come from lanterns, garden torches ...or nothing at all. Create a spa-like pampering experience with scented candles, potpourri, and other fragrant products. No personal oasis is complete without soothing music - create a waterproof corner for a MP3 player. 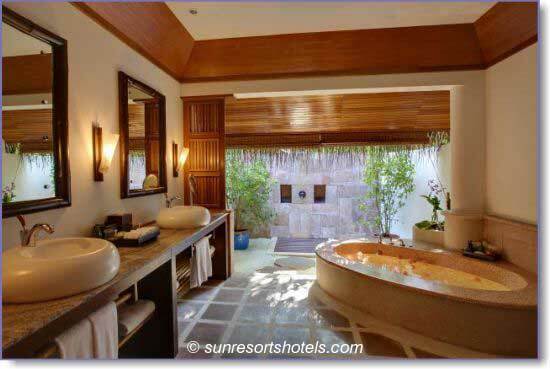 Outdoor bathrooms are popular because of the intensely personalized environment they create. There is something deeply gratifying about being naked outside, under the sky and once you've experienced that, you may just want to explore the idea a bit more! 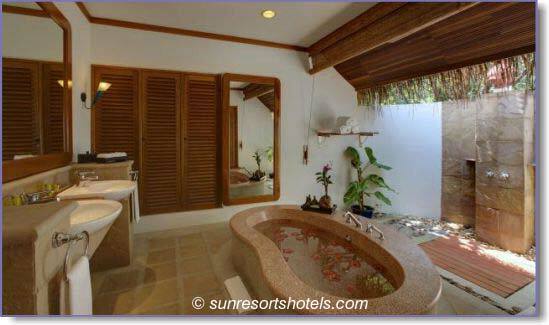 Sun Resorts Limited and Sanctuary Retreats as per the copyright notices on the images. 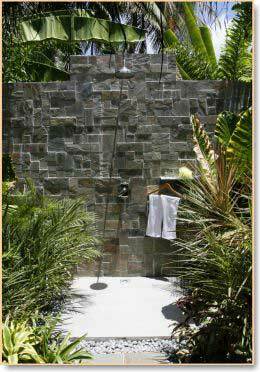 Visit our Outdoor Shower page for more ideas as well as practical guidelines. Our Bathroom Layouts page has scaled drawings to assist you with your bathroom floor plans.